Most Press Responsive News Magazine Blogger Template is a great premium blogspot theme having same features as paid themes have in them, and it is suitable for news and magazine blogs or simple reviews sites. It has light, dark and high contrast color skin and awesome look homepage style. It is fully SEO optimized using latest advanced Search engine optimization factors. This Theme comes with sticky fixed sidebar, Owl Carousel and Social Sharing Buttons, Beautiful Drop-Down Menus with White Color Shine, Home Menus, Animated Search Bar, Cinema look featured Post Content Slider, Stylish Labels Widget, 1 Sidebar, 4 Footer Column, Numbered Pagination bar, background Image Option, Related Post Widget and Author Bio Box gadget below every post and article and much more other stunning options has been added in it. 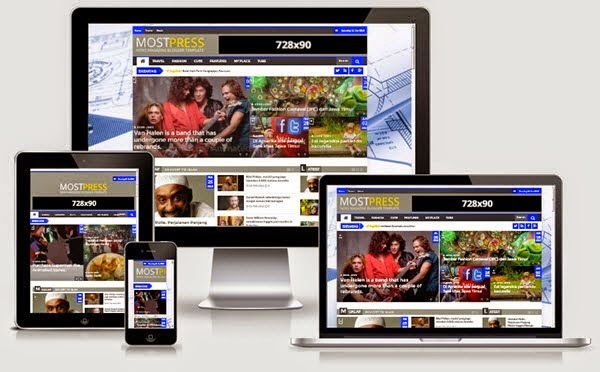 Most Press News Magazine Blogger Template is perfect for entertainment, Showbiz, Tips and Tricks etc. It is fully Adsense ready having Bigger Ad spots in it. Moreover it is the best blogspot theme ever having lots of professional features and premium qualities.